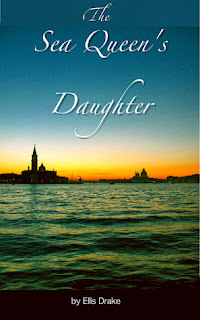 Please help me welcome author Ellis Drake to A Buckeye Girl Reads. She's here today answering questions about her newest book, The Sea Queens Daughter. Which character was easiest to write? I'm not sure about easiest, but Anechino and Tusco, Marco's friends, were definitely the most fun. Anechino in particular is full of energy and contrariness, so his dialog is always fast and snappy. They were also interesting to write because I based them off of commedia dell'arte characters. Which one was the hardest to write? Possibly the Sea Queen, because I wanted her to be scary but not too much like Ursula from The Little Mermaid. 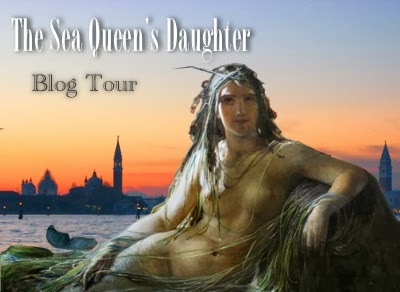 What was your inspiration for The Sea Queen's Daughter? I was thinking about setting a story in Venice when I saw an anthology call for fairy tale adaptations and thought, "What better fairy tale to set in Venice than The Little Mermaid?" I knew I wanted to include Carnevale and the Ascension, so that set up the framework of the story. Did you have to research anything for the book? If so, what was the most interesting thing you discovered? I did a ton of research for The Sea Queen's Daughter. Everything from the history of Carnevale, the masks used, commedia dell'arte characters, traditional Venetian names, the architecture of Venetian homes, native fish in the lagoon, and the different names for boats (if Eskimos have a hundred words for snow, Venetians have a hundred words for boat). I think the most interesting thing I discovered was how serious the Venetians were about maintaining anonymity during Carnevale—everyone went out in public with a mask, it was illegal to unmask or even touch someone, and identifying a masked person by name was taboo. It really was a time when people could do practically anything without consequences. Do you have a favorite comfort read? Not a single one, but I'll usually reread a book by Lisa Kleypas, Christina Dodd, Barbara Michaels, or Mary Stewart when I'm in a mood. Always! I plan on publishing my hipster mystery—or "hipstery," as I like to call it—next, and I'm currently working on a tale of greed and betrayal set in northeast New Mexico. Thanks for having me today, Colette! For those of you interested in reading more about the history of Venice, I recommend Venice: Pure City by Peter Ackroyd.